If you have combine or tractor tires with sidewall cuts, chipped lugs, or even bead damage, the following 3 types of vulcanized repairs can save your operation hundreds or thousands of dollars in tire replacement costs. It's never good news when you're staring at your tractor tire's cords through a giant gash. It could take hundreds or even thousands of dollars to replace a ruined tire. At this point, it's easy to think that the tire is junk, but in reality, it's probably still good thanks to vulcanizing technology. Vulcanizing repairs can save your operation hundreds or thousands of dollars in tire replacement costs. 1. What are the different types of vulcanizing repairs? These repairs involve the most severe type of tire damage—when a tire has a cut through the cords. Section repairs include sidewall, face, and shoulder reinforcement. To perform this repair, the damaged area is ground or beveled out, layered with new ply on the inside, and filled with new rubber on the outside of the cavity. Then, a high-pressure heat cure forces the rubber tightly into the cavity to complete the repair. 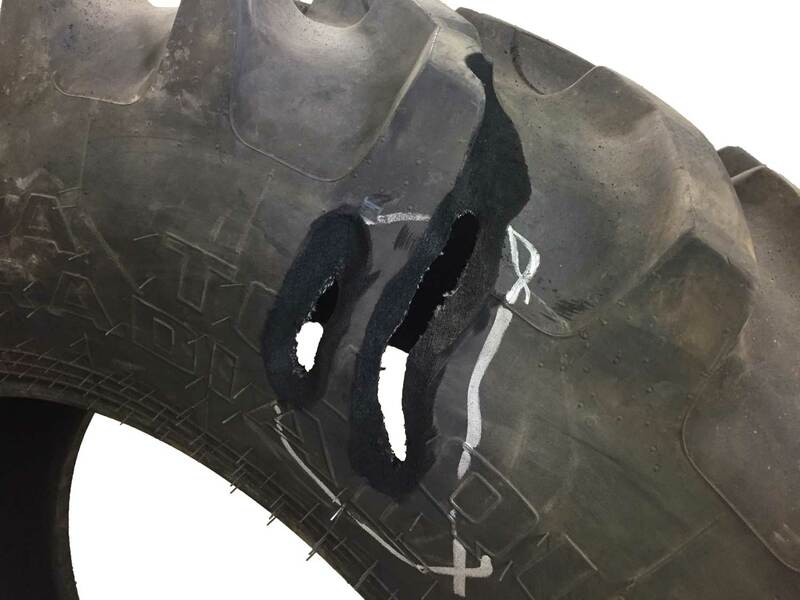 The damaged area of the tire is beveled out during a vulcanized section repair. Our success rate for this type of repair is about 95%. Plus, these repairs usually outlast the tire under general use and pulling situations. Tires with section repairs are not recommended for high-load applications such as on combines, grain carts, or loader fronts. We also recommend using Orange Slush tire sealant to completely guard against future leaks. This type of repair involves external tire damage that does not involve the cords. Examples include sidewall cuts, chipped lugs, cracks in the shoulder, and bead damage. With spot repairs, the damaged area is ground or beveled out and filled with new rubber on the outside of the cavity. A high-pressure heat cure to forces the rubber into the casing and cures the tire. Some bead repairs will require a tube. Our success rate is over 99% with this low-risk repair, and it works with any application. This type of repair involves the inner lining of the tire as it thins and the cords become exposed. 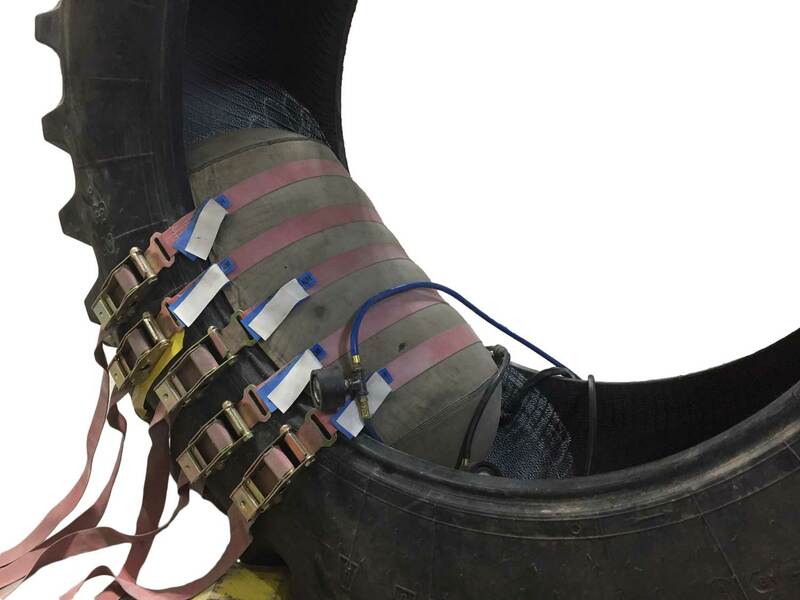 As with section and spot repairs, a layer of rubber is applied to the inside of the tire and a high-pressure heat cure to bonds the layers together for a lasting repair. Our success rate for this repair is nearly 100%. A high-pressure heat cure forces rubber into the cavity and completes the vulcanized repair. 2. When is a tire unrepairable? Even though some of the most severe-looking gashes can be repaired, not all are fixable. We recommend having an experienced vulcanizer inspect the tire for an accurate analysis, but as a general rule, a tire is unrepairable if the cut goes through the cords within 2" of the bead, or if the cut is over 7" long. 3. Are some tire vulcanizers better than others? Yes. In the same way that you choose your mechanic based on his reputation, tire vulcanizers vary in their quality of work. 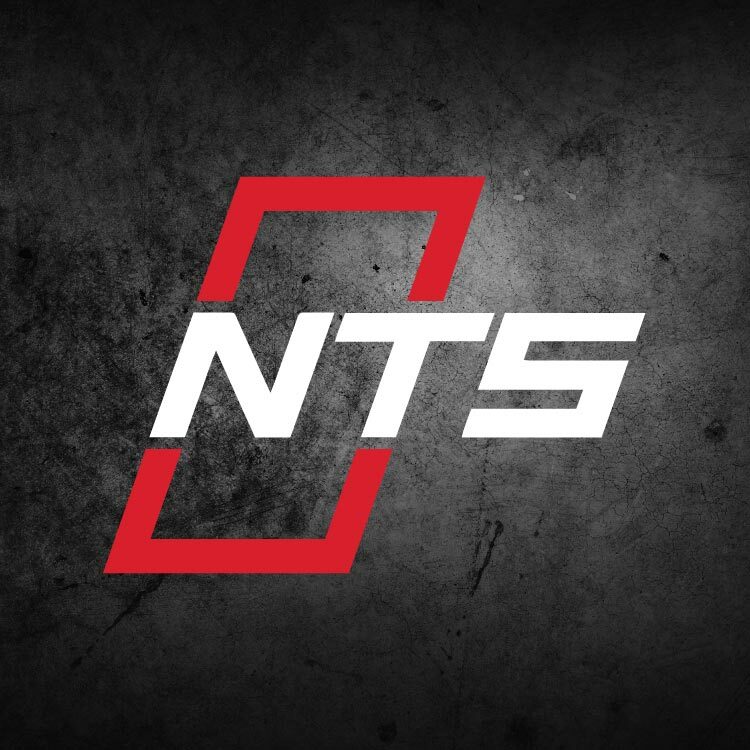 At NTS Tire Supply, we are fortunate to have Gary, an experienced vulcanizer who performs hundreds of large ag and OTR tire repairs every year. And as a company, we stand behind every repair job with a full 2-year warranty. In the rare case that a repair fails, we’ll redo the job free of charge or refund the full cost of the repair. And we’re not afraid to tell you when a tire is unrepairable. Why? Because we’ve built our business on long-term relationships, not one-time sales. Just as you choose an electrician or a mechanic by his reputation, our goal is to be your trusted resource for expert assistance with tires and other wheel hardware. Call our team at 800-854-4554 or fill out our online contact form today to get your tire repairs scheduled. Our team is driven to serve you.